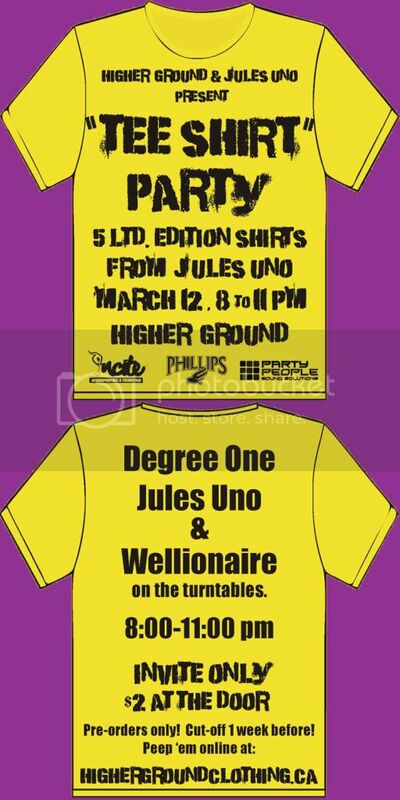 Degree One Events: Jules_Uno's Tee Shirt Party !!! Jules_Uno's Tee Shirt Party !!! 5 Ltd. Edition Tee Shirt Designs by Jules_Uno inspired by Victoria's Underground History. Available by pre-order with a pick up party on Saturday March 12th at Higher Ground from 8-11pm, or you can order your favorite shirts while at the party and they will be ready for pick up in under a week. Degree One, Jules_Uno and the Wellionaire on the decks and Good Times are in effect!!! Facebook Event page here... RSVP and Invite your friends..! !